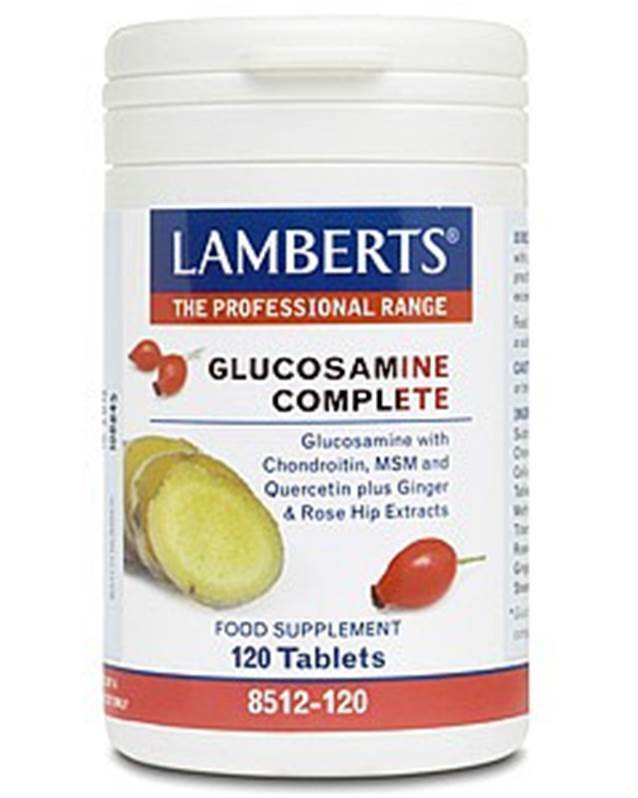 Lamberts Glucosamine Complete - Glucosamine with Chondroitin,MSM and Quercetin, plus Ginger & Rose Hip Extracts. Three tablets provide the full 1500mg of glucosamine sulphate that studies have confirmed as an effective dose. Lamberts state they have used the highest grade of glucosamine sulphate available that is close to the profile of naturally occurring glucosamine produced by the body. A valuable but expensive nutrient in joint care. This product contains a full 300mg per daily dose. Scientists are now uncovering the powerful properties, valued for centuries by traditional herbalists. Especially rich in vitamin C and useful for maintaining strong and healthy blood vessels. At a 100mg extract this level is not just for show! Lamberts' MSM is sourced from the purest form available and Glucosamine Complete contains a meaningful dose of 150mg per daily dose. This is a powerful bioflavonoid found in fruits, especially apples, and is the subject of a number of human studies that have uncovered its important properties in relation to joint health. Glucosamine Complete contains 60mg of quercetin per daily dose. Lamberts have included the equivalent of a full 1200mg of ginger (as a 60mg extract) in their Glucosamine Complete formula, and at this strength the warming properties of ginger help to keep the blood flowing throughout the capillaries surrounding our joints. Many combination formulas simply contain powdered ginger. Three tablets provide the full 1500mg of glucosamine sulphate, the level used in many studies, as well as 300mg of chondroitin sulphate (see note below) and 150mg of MSM per daily dose. The powerful bioflavonoid quercetin has been included at a potent 50mg, plus 1200mg of ginger (as a concentrated extract), as well as 400mg of rose hip. Few, if any, joint formulas provide these potencies in a single formula. Chondroitin mislabelling: Many companies use a preparation that is just 20% chondroitin but their label may declare this as if it is 100% chondroitin. Therefore a supplement declared as ‘400mg chondroitin sulphate’ is often just 80mg of chondroitin. Of course this Lamberts® supplement provides 330mg of a 90% chondroitin sulphate preparation (per 3 tablets) to provide the 300mg of pure chondroitin declared on the label. A white oval coated tablet. Modified Starch, Cellulose, Tablet Coating (Colour: Titanium Dioxide Hydroxypropyl Methylcellulose Glycerin), Silicon Dioxide, Stearic Acid, Magnesium Stearate.